Are you starting to plan your Easter festivities? Its been pretty apparent here on the blog that I’ve had Easter on my mind for a couple weeks. In the past few years we have spent Easter with my family in Nashville, I’m a little sad we won’t be there this year but I’m excited to make great traditions for my kids here at home. I’m working on making their easter baskets (hoping to share that next week!) and I’ve been thinking about my Easter brunch menu. 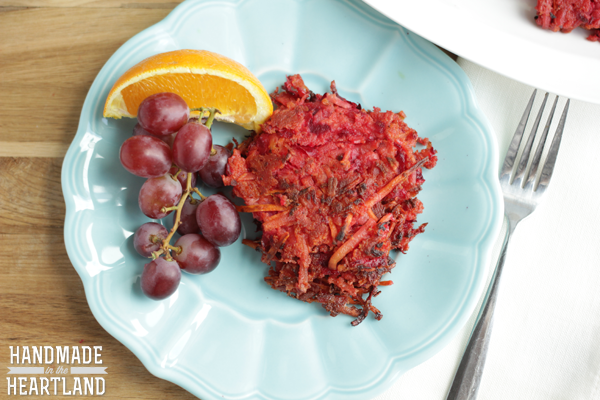 When I whipped up these latkes made with shredded potatoes, beets and carrots i thought they would be perfect for brunch! 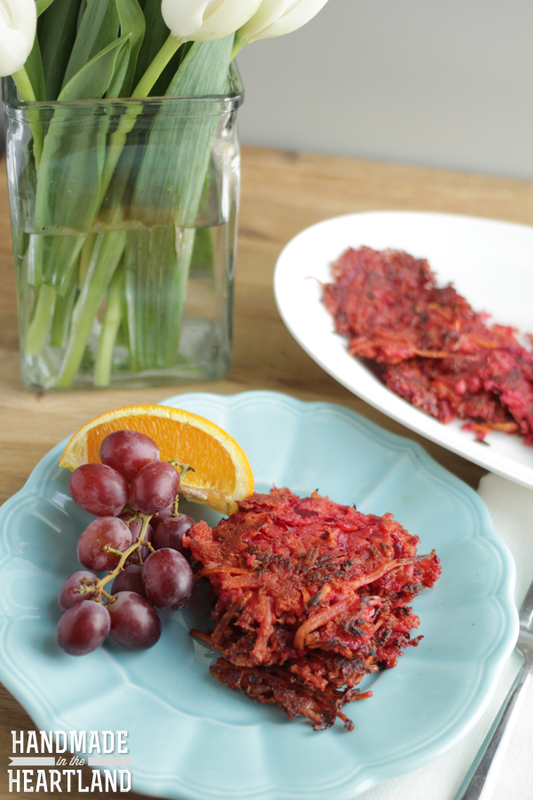 I love to use fresh ingredients in my recipes and I love to experiment with new foods, the only other time I’ve ever eaten beets was at a fancy restaurant but I keep seeing them shredded so I decided to give them a shot. I also have a list of things to cook and Latkes have been on that list for a while. 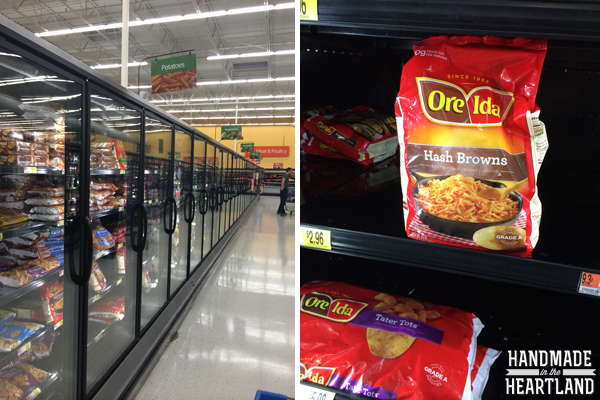 In an effort to save a little bit of time I used pre-shredded carrots and Ore-Ida Shredded Hash Brown Potatoes that i picked up at walmart. Peel and shred your beets and onion. 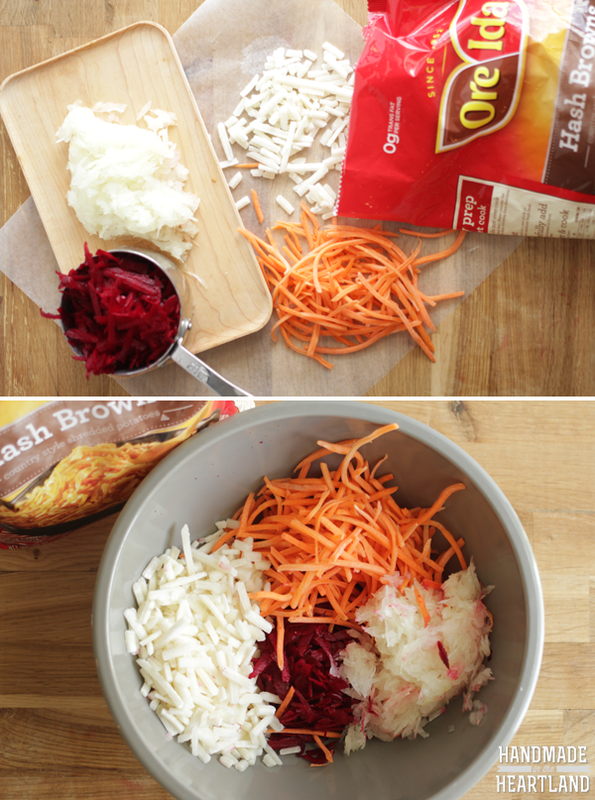 Mix the beets, shredded hash brown potatoes, carrots, onions, panko breadcrumbs and salt & pepper to taste together. Mix in the eggs. The trick is to make sure that your mixture isn’t too wet or they will fall apart while frying. If the mixture does get too wet try to squeeze some of the excess liquid out with a paper towel. Heat a heavy-bottomed skillet over medium-high heat and add enough coconut oil to have a thin layer cover the bottom. Scoop about 1/4-1/3 cup of the mixture into the frying pan once its heated up. Take a metal spatula and press the mixture down into the pan so that it flattens. Let it cook for 3-5 minutes and then flip and cook the same on the opposite side. My pan allowed me to cook about 3 at a time. Once they have a crispy crust remove from heat and set on a paper towel to drain any excess oil, then serve warm. Enjoy! 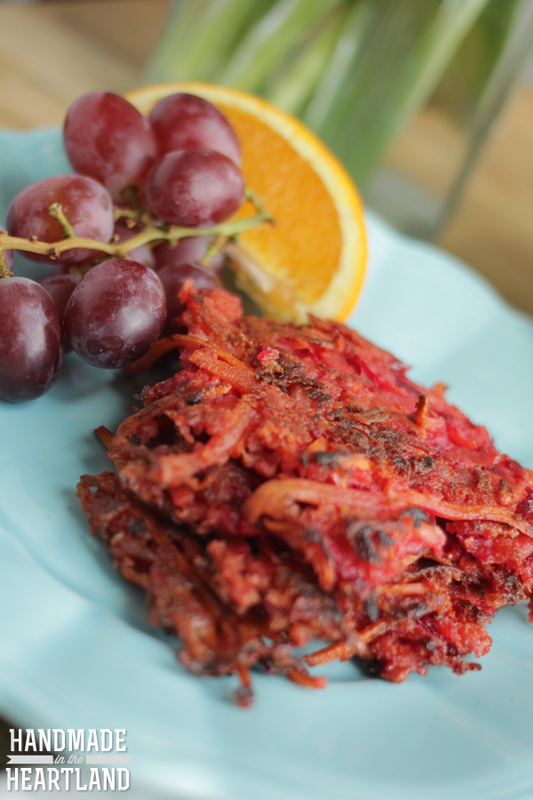 I really loved the taste of these latkes, all the shredded veggies gave it great savory flavor. I really believe a crispy crust on almost anything is a good thing, so don’t take them off the heat too quickly because the crispy-ness is key! 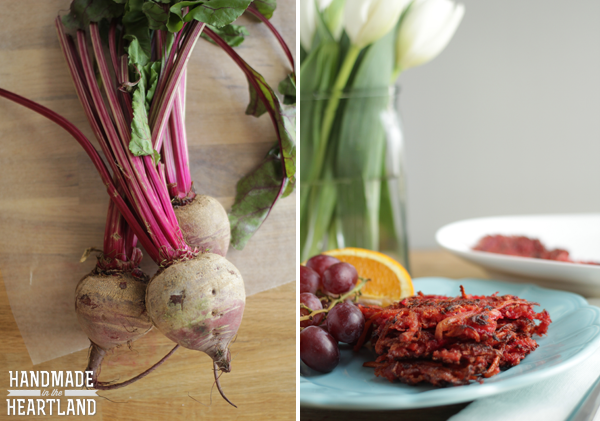 Have you ever cooked with beets? 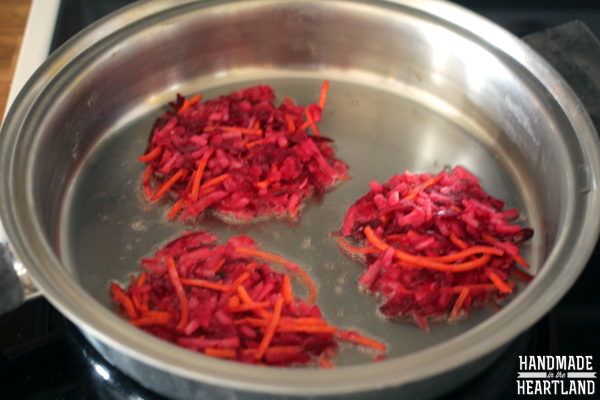 This was my first time and honestly I couldn’t even tell you what they specifically taste like because the flavors of the beets, carrots, onions and Ore-Ida Shredded Hash Brown Potatoes blended so well that I couldn’t pick out a distinct beet flavor. 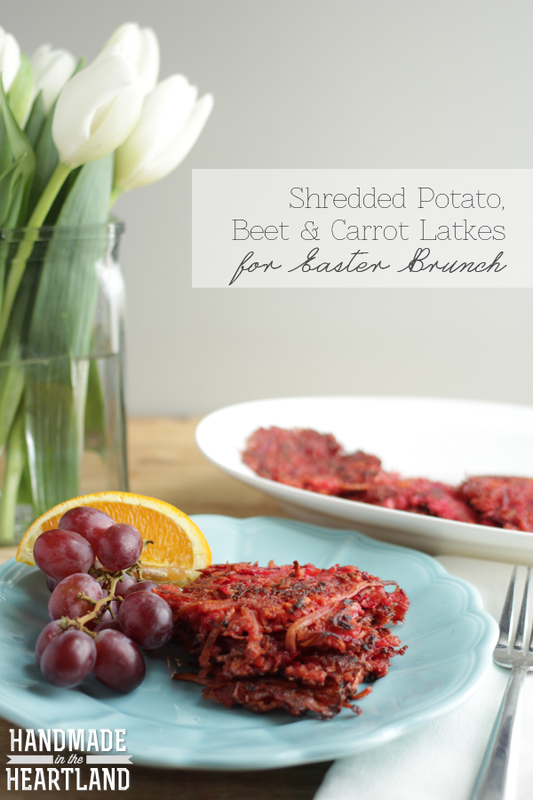 The beets add such great color and lots of nutrients to make these latkes a great option for a healthy Easter brunch.